I’d say I’m not a crier, but that’s not true. What I am most definitely not is someone who cries during her biggest race to date. And yet there I was, walking to transition from the swim, the arm of a kind stranger on my shoulder and my hand over my mouth as I cried. 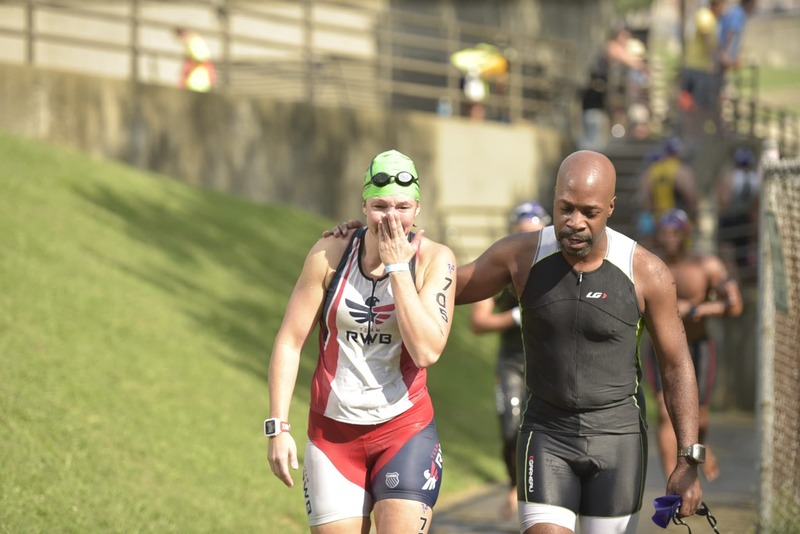 This kind stranger at the Music City Triathlon in Nashville, Tennessee walked me up the ramp from my very emotional swim. I like to do hard things. It’s why I enjoy CrossFit and why I adore triathlon. I also like being faster. I don’t really even want to be the fastest. I just want to be faster than the person I just passed. An hour and 15 minutes prior, I had jumped into the Cumberland River in Nashville, Tennessee to swim my first ever 1500 meters for my first ever Olympic distance triathlon. For five years I had raced Sprints — this was my moment. I had trained since February, hitting the pool, visiting open water locations. I was ready. “705!” They called out my number and – splash – I was in the water. I felt like a boss as I flew through the first 200 meters. I paused and waved at my husband and kids — I could hear them ringing their cow bells as they ran along the shore. “Crossing the river will be the most challenging part of this race,” the race director said into her megaphone an hour prior. I could barely hear her. I didn’t really listen. I turned tightly around the first buoy, heading across and slightly up the river. Stroke, stroke, breathe …. stroke, stroke, breathe. I raised my head to the side — and, wait. The buoys were now 50 meters to my right. Stroke, breathe. Now they were 75 meters. As the current pulled me and others down river, I realized I needed to pull harder and head straight for the shore. When I got to where my feet could touch I walked with others up the shore line, hoping to get even with where we were supposed to be. I remembered the director’s warning. That was the hardest part, right? But it was far from the hardest part. With a 900 meter, straight up river swim in front of me, I started what I felt was a powerful crawl, headed for the orange buoy in the distance. Things went OK until I got close to the bridge and realized that while I was working like I was moving forward, I was making very little progress. The race director was wrong. The visual impact of the current was most dramatic while we were crossing. But in practicality that was nothing compared to swimming straight into it. I am a decent swimmer. I had trained for this. And I had estimated, based on last year’s times, that it would take me 35 minutes. I had not planned for a 1.5 mile per hour current. A pier ran along the shore, under the bridge. I joined other racers holding onto the edge and crab walking our way past the bridge. Open water swimming can feel like a time warp, without a clock or marked distances or pool walls to gauge how long you’ve been there. I worked and worked and worked. “Maybe I’ve been doing this for 30 minutes,” I thought. My shoulders were burning. But there was that buoy — never closer, and sometimes even farther away. I saw a woman grab onto the kayak. “What happens if I hold on for a minute?” I asked, panting. “Not a thing,” said the paddler. The frustration welled up inside me. I did not train so hard for so long to quit during the swim. I am not a quitter. While the option remained, I was going to stay in the water. I tried again, this time hugging the shore as much as possible, I swam up and overshot the buoy so that I could hit it being pushing back down river. But I still missed it. Yet another attempt — against the shore first, swimming up even farther. This time I was able to cross fast enough to hit as I was pushed back down river. In what seemed like a blink I was down river at the dock exit point. It was as I climbed out the stairs that the tears came. I couldn’t talk. “Do you need to sit down?” a volunteer asked me. “No, no, I’m OK, I’m just ….” crying. Crying because I wasn’t in the water anymore. Crying because I had been in the water an hour and 15 minutes. Crying because this wasn’t at all my race plan. Crying because I was exhausted and wondered how in the world I was going to keep going. Crying because it hit me that I had just done something horrible and wonderful at the same time. I had swum my longest race ever in terrible conditions, and I had not quit. As I walked up the ramp, crying, another racer who did the shorter course and had not gotten out of the water long before me put his hand on my shoulder. I didn’t even really look at him — instead I just felt grateful for this act of humanity. Because even though racing is about beating the other guy, it’s also about doing something in a community of people who do hard things. And on that day, we did hard things together. I love that facebook and blogging was able to get this back to the man was so kind!! I love these kinds of stories!!! This is why I tri! I’m not running anywhere unless there is a bear involved, but this was a poignant and beautiful metaphor for life in general. Most especially for when life gets tough, as it so often does. You’re amazeballs.